Although the team has been back from TNNA for weeks now, we've been so busy that it hardly feels like it! 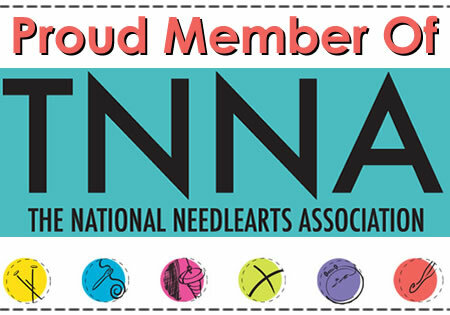 The TNNA trade show features a short event where shop owners can purchase kits to check out available yarns before the actual show floor opens. We had two kits available at this season's TNNA, Mermaid Shawl by Vera Sanon and Wish I Might by Irish Girlie Knits. The Mermaid Shawl by Vera Sanon was worn as Anzula's entry in the TNNA Fashion Show. The shawl requires one skein each of contrasting colors of Mermaid. It would also look pretty gorgeous as a one-color piece, too. Wish I Might by Irish Girlie Knits is knit in our new sparkling Nebula yarn. We sold out of this kit more than once during the Sample It! event! Although the sparkle is hard to see in the photos, the yarn is definitely full of beautiful sparkle that inspired this great shawl. Both patterns are available on Ravelry, and the yarns are available at your local LYS. See our where to buy pages for a local shop or online retailer.